Ropeworks Active | activities and Adventure provider. Set in beautiful woodland with breath-taking views of lakes and mountains, Ropeworks Active is a memorable experience for families, groups or individuals. Join us to explore our Ropes Courses, or why not try out our Offsite Adventure Activities (including Climbing, Gorge Scrambling, Coasteering, Underground Adventure and Hill Walking). 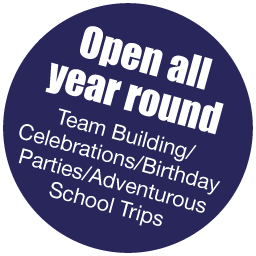 Larger group – happy to organise group bookings for schools, youth organisations and businesses. Get in touch to book or find out more! We are fully AALA accredited. Perfect for the younger members of the family, spend as long as you like traversing rope bridges, scrambling through nets, sliding through tunnels and zipping in the trees. Two hours of adventure take your pick from rope bridges, a hanging climbing wall, spiders web, giant swing, tower abseil, external climbing wall and leap of faith. Why not join us for an extended session and fit more activities in! Snowdonia is a huge adventure playground. Come and explore it with Ropeworks Active! Ropeworks active is an ideal venue for groups. We’re fully AALA licensed and highly experienced in providing bespoke packages to suit your group needs. Contact our staff via email or telephone to organise your event, celebration or project. Peak/High Season we are open from 0930am to 5pm daily. Low Season: Closed Mondays, fully open on weekends and open for pre-bookings only Tuesday to Friday. We are in Parc Gwledig Pardarn on the banks of Llyn Padarn in Llanberis, just next door to the Slate Museum.